Some recent additions |Sundews Etc. I recently visited California Carnivores and took a lot of pictures. 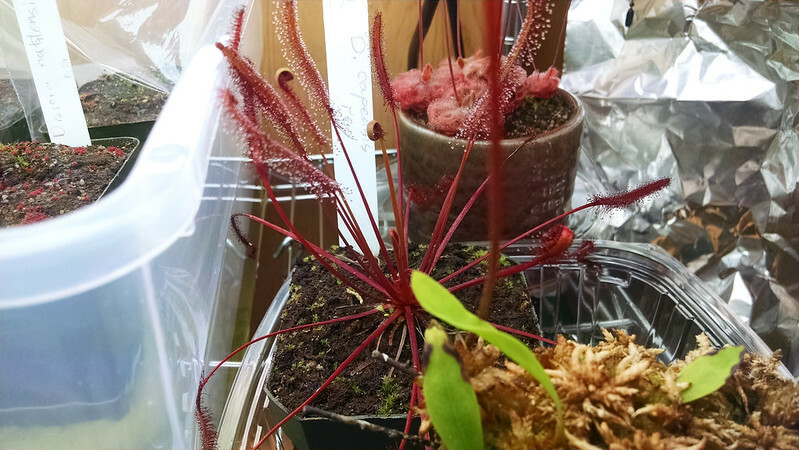 I also used $50 in gift cards that my Drosera burmannii won for me at the 2014 BACPS Show. After an amusing misstep trying to buy some display plants, I came away very happy with 5 new acquisitions. I then took them on an hour ride home in a baking hot car with broken AC. They looked a bit wilted right when they got home, but in the intervening couple weeks they've perked up nicely. The funniest plant I got is Utricularia longifolia. An organic-looking mound of U. longifolia and Sphagnum. Damon was nice enough to hunt this plant up from somewhere in the back to sell to me, along with the living Sphagnum it's growing in. U. longifolia is considered one of the weediest of the large, showy utric species. It also has truly fantastic flowers. 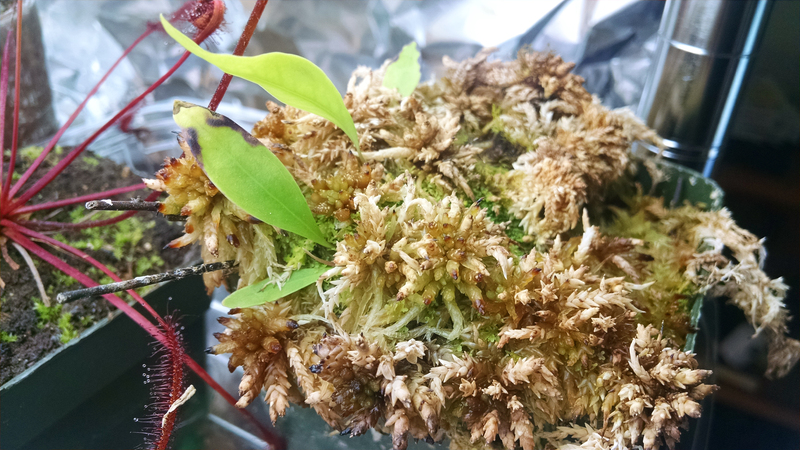 My little plug is probably a ways away from blooming, but I've noticed some new growth peeking out from among the Sphagnum. Exciting! I was also on the hunt for some pings. My girlfriend really likes them, and they add some nice diversity to my growspaces. 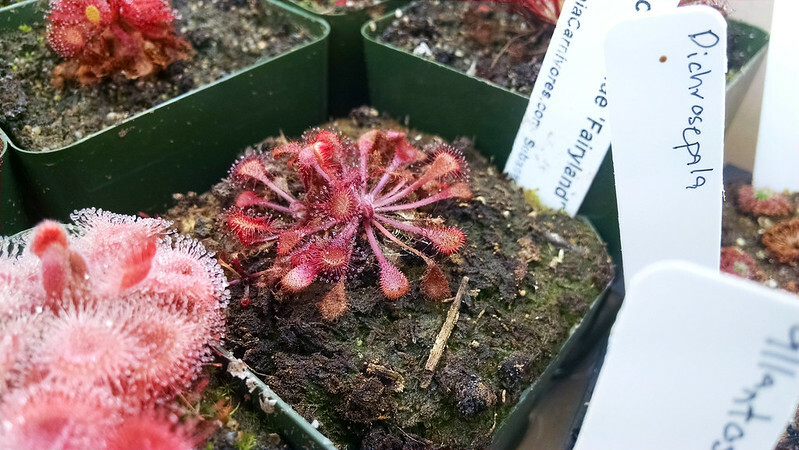 They're also sort of hard to find for sale compared to sundews. 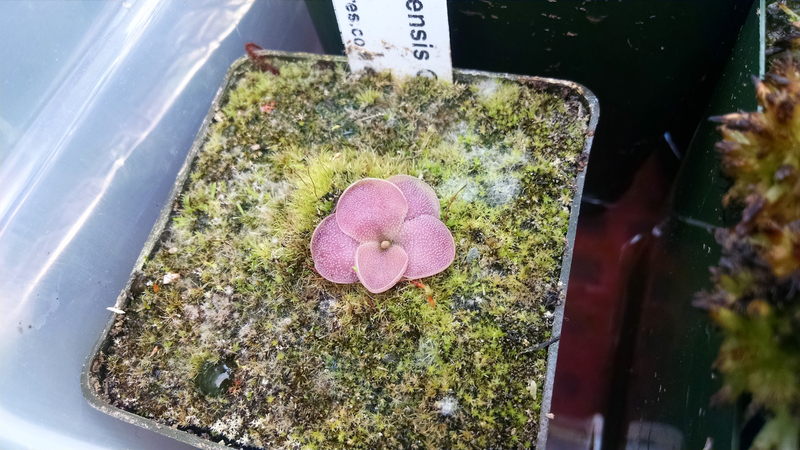 But I found a cute little Pinguicula moranensis. This plant looks so friendly. A friendly Ping. Of course, I'm always looking for new sundews. 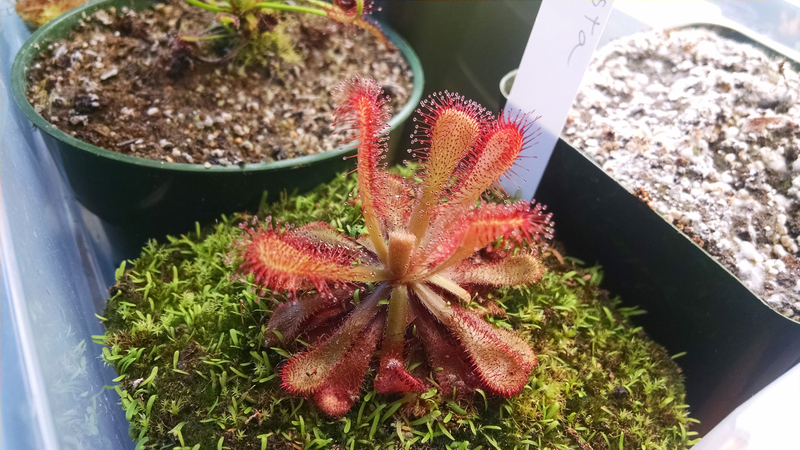 I was able to get 3, including another addition to my Drosera capensis collection. The red form of D. capensis is quite different from other forms, not just in color. It's the red form! This form has long petioles and fairly narrow laminae, and of course that fantastic red color. Right now it's sort of off to the side in one of my annex trays. One of the many chores I need to complete is a re-organization and consolidation of my trays to be more efficient and to show off plants better. The plant that least enjoyed the car ride, and which has taken the long time to get back in shape, is Drosera collinsae. Hopefully this D. collinsae perks up even more in the next few weeks. It's finally gotten a bit of dew production going and has recovered from looking totally wilted. Hopefully if I feed it and it puts on some new growth it will start looking even better. The last sundew I got has been my favorite for the last few weeks. It's showy, dewy, and growing like crazy. I've really been admiring this plant lately. Drosera venusta! And look, it came with lots of free Utricularia in the pot, hahahah. I feel like pictures I've seen of D. venusta online haven't done it justice. I'd thought it was just a rosetted species like Drosera aliciae or something, but these upright leaves are super nice. Nice colors as well. I'll have to take another trip soon, since they're supposed to have Drosera slackii in stock. Gotta get more sundews!